From the smoky shores of South Islay comes Ardbeg, a distillery that has defied the odds and a turbulent 200 year history to become one the island’s paramount distilleries. Typical of the Islay style, Ardbeg is defined by its maritime and meaty peat smoke, rich and bold in flavour. Despite the competitive nature of Islay whisky, Ardbeg- with its smaller production- matches the quality of its illustrious neighbours, and rightfully remains one of the most sought after whiskies in the world. The distillery provides a welcome relief for the linguistic layman, with its simple name amongst a sea of difficult Gaelic. That said, the name does derive from the Scottish Gaelic Àrd Beag, meaning "Little Height", somewhat ironic considering the strength and stature of this Islay powerhouse. Ardbeg’s history is somewhat reflective of the history of Scotch whisky as a whole: a boom in the late 19th century, disaster in the 1970s and 80s, and a carefully managed single malt revival at the turn of the millennium. It is also a perfect example of what the consequence of good and bad management can be. Ardbeg, like many Islay distilleries, began its life as an illicit still, and spirit had been produced for around 20 years before the year of its "Official Establishment" in 1815. Ardbeg shares its birthyear with its illustrious neighbour- Laphroaig. Thus, 2015 marks the bicentennial of both. Ardbeg Malt Whisky spent the lion’s share of its history in blends, only really seeing releases as a single malt in the latter part of the 20th Century. Luckily for us tastes have changed, and Ardbeg spirit is now overwhelmingly produced for sale as a malt whisky. The distillery previously had an in-house, and somewhat unique, unfanned floor malting, said to give the whisky an "espresso flavour". However, following Hiram Walker’s decision to get rid of the floorings (bemoaned by whisky connoisseurs), Ardbeg now buys its malted Optic barley from the Port Ellen Maltings. The vast majority of grain they use is peated to 50ppm. This grain is then mashed twice a week in an increasingly rare Boby mill from 1921, using over 54 tonnes of malt. Ardbeg uses a grist ratio of 70% grits, 12% flour and 18% husks. At the mashtun, repaired by Glenmorangie, this mash is mixed with water sourced from Loch Uigeadail three times. The wort is then pumped to the washbacks- which are also relatively unusual, as they are made of Oregon Pine as opposed to stainless steel, and this imparts flavour into the beer produced. Ardbeg then adds Mauri yeast, and begins fermentation. Due to the highly phenolic mash and in an attempt to retain these phenols, fermentation is a slower process here than at many distilleries, taking sometimes up to 62 hours. The barley beer produced is between 7.5% and 8% ABV, a little stronger than in many other distilleries. After the long, slow fermentation process, it is finally time to liven things up and distil! Ardbeg runs just the 2 stills- one each of wash and spirit. The Ardbeg stills are fairly unremarkable: pot stills, about 3.75 metres tall and steam coil heated. However, they do have one unique bit of kit: "the purifier". This is attached to the Lyne Arm of the stills, and captures the heavier, more phenolic parts of the spirit, feeding them back into the still to condense the flavour. This means that the heavily peated spirit come through in the second part of the spirit run, allowing Ardbeg to better gauge the amount of peated spirit that goes into the new make, making for a better balanced whisky. Ardbeg claims that the purifier almost has the effect of an extra distillation. Ardbeg then takes the cut after the first ten minutes of distilling, coming in at between 72-68%. The whole distilling process takes about 13 hours- five for the low wines run, five for the spirit and three redistilling feints. The distillery has relatively few warehouses, with just the five. Three of these are racked, but two retain traditional storage. All these warehouses sit close to the sea, and thus absorb many maritime notes during maturation. Ardbeg’s most used casks are first and second fill bourbon barrels from Jack Daniels, though recently they have used sherry and new French oak casks too. Many of these casks, whilst resisting the crashing waves, have weathered turbulent times at the distillery too. John McDougall is credited with founding the distillery, and his son Alexander took over proceedings in 1838 when spirit merchant Thomas Buchanan purchased the distillery for £1800 (over £130k in today’s money). In 1853 Alexander McDougall died, leaving Colin Hay and the two McDougall sisters, Margaret and Flora, run the distillery. Ardbeg suggest that they were Scotland’s first female distillers, though Laphroaig also lays claim to this distinction. The 19th Century was a period of incredible success for Ardbeg, employing 60 staff, with production topping a million litres by 1887, making the distillery the most prolific on the island. Unfortunately, they were not to repeat this success in the 20th Century. After registering the distillery name and distinctive "A" symbol as a trademark in 1911, the distillery changed hands a number of times, being bought and sold by inventively named companies Alexander McDougall & Co. and Ardbeg Distillery Ltd. (1922 and 1959 respectively). The distillery suffered greatly in the global whisky downturn of the 1970s, before being purchased by Hiram Walker in 1977. This ownership would prove to be disastrous (the removal of the in-house floor maltings, a decision that reduced running costs, changed the character of the malt utterly), and Islay’s once most successful distillery was mothballed for the first time in 1981. Allied Lyons purchased Hiram Walker in 1987 and after an eight year break, production resumed in bursts (mostly to sate the desires of blenders), but in 1991 the distillery fell silent for a second time. However, at the end of a horrible century, the Glenmorangie Company (in turn owned by luxury goods giants Louis Vuitton Moët Hennessy) bought Ardbeg and full scale production resumed in 1997. They had a daunting task, the distillery was in disrepair and the heating tanks, malt conveyor, feed tanks, steam line and dust aspirator all needed replacing, in addition to a new warehouse roof and three new washbacks. Nevertheless, Glengmorangie pushed ahead and the turnaround was remarkable in both its strength and speed, and just a year later, Ardbeg was voted distillery of the year. In 1999 production reaches staggering heights with 600,000 litres of spirit distilled. Finally, after more awards and numerous lauded releases the Ardbeg revival was complete with production for the year 2005 matching the previous record of 1.1million litres set in 1887. Crucial to this revival were the distillery staff. Ed Dodson, who went on to manage Glen Moray, oversaw many of the repairs in the first six months, and restarted the production processes. Stuart Thomson supervised the majority of the post LVMH period as Master Distiller and Manager. Thomson was a veteran distiller, having previous worked for Glen Moray and Glenmorangie, and his expertise was indispensable in getting the distillery back on its feet. He also showed a great humanity- reaching out to former Ardbeg employees who had lost their jobs when the distillery closed, and restoring them to their roles. In 2007 Michael Heads became the Manager and Master Distiller. Alongside its divisive flavour, Ardbeg has been a strong proponent of the equally polarising Non Age Statement whisky: only one of their standard line carries an age statement, the other whiskies adopting mysterious Gaelic names instead. 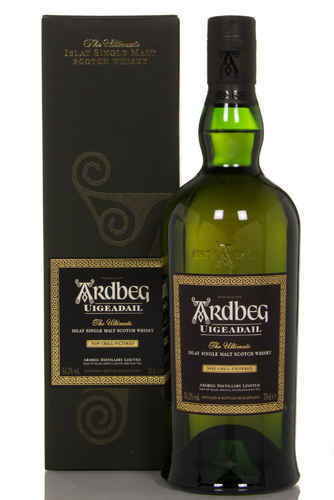 Ardbeg currently offers three bottles as part of their standard line, all are non-chill filtered. Ardbeg Ten, bourbon cask, most pronounceable. Uigeadail, wildly successful and partly sherried. When Glenmorangie took over, they were sitting on a huge amount of stock from the 1970s and early 80s. The 1975 and 1977 vintages are recognised as some of the best whiskies to have come out of the distillery, whilst the 25 year old "Lord of the Isles" (there were apparently many Tolkien and Golding fans in the marketing department) is extremely rare and valuable. IBs from the 1970s are also highly recommended. The 17 year old whisky, one of the first products released under Glenmorangie is also much lauded. 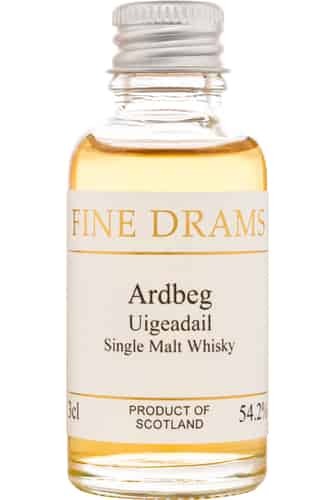 Whilst Uigeadail remains consistently good, the earlier batches are supposedly of a superior quality. In addition to these, Ardbeg have released some notable limited edition whisky, particular amongst these are the 2009 and 2014 ultra-heavily peated Supernova. If you come across any of these whiskies at a reasonable price, either in bottle or dram form, they are likely to be very much worth your money. Ardbeg is the world’s first, and so far, only extra-terrestrial whisky, after 20 vials of the juice was sent to the international space station, to see what effect gravity has upon the aging of whisky. This event was marked with the release of Ardbeg Galileo and the second edition of Supernova. Mark Reynier, the London wine merchant, briefly flirted with buying the distillery in the 90s, before settling on Bruichladdich. Ardbeg has its own day of celebration, the creatively named "Ardbeg Day", which is 31st May every year. This is marked with a special release, recently the 2014 release "Auriverdes" paid tribute to the FIFA World Cup in Brazil. Ardbeg’s promotional committee has over 50,000 members worldwide. Finnish poet and composer Osmo Tapio Räihälä was so struck by the flavours of Ardbeg whisky that he was inspired to write the symphonic poem "Ardbeg- The Ultimate Piece for Orchestra". It won first prize in a Finnish composition contest.